This entry-level Weslo Cadence G-25 treadmill is from Icon Fitness which also manufactures Nordic Track and Proform treadmills. Buyers who find themselves owning one of these probably bought it solely because of the low price and not for the features. The factors you want to carefully evaluate in purchasing a treadmill include its stability (the "wobble" factor), durability and reliability (how long will the motor and parts last? ), ergonomics (how well it fits your size), and cost. And one more thing: know your motor rating before you buy a treadmill such as the Weslo Cadence G-25. UPDATE: The Weslo Cadence G-25 is no longer available. Check out the full lineup of Weslo treadmills at reduced prices here. In a nutshell, the Weslo Cadence G-25 treadmill has a very small belt (even a small woman has shoulders wider than 13") and a very brief warranty is thrown in for laughs. Even more of a concern is the 1.0 THP Impulse™ Drive System motor. That "T" in THP refers to true or peak horsepower; it is NOT a continuous horsepower (CHP) motor. That means the Weslo Cadence G-25’s motor delivers about half the CHP (in the case, around .5 to .6 CHP) that you thought you were buying. This isn’t a marketing switcheroo, but you should understand the difference between CHP (which most treadmill motors come rated as) and a THP motor. At a minimum, we recommend a 1.75 CHP for walkers; 2.25+ for joggers and heavier people. 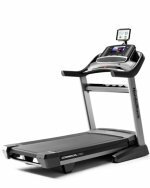 Consumers are unfortunately lured by the price of cheap Weslo treadmills when they see them at Wal-Mart or at closeouts in sporting goods stores. They walk around them, stand on them, see the shiny LCD display and think, "Wow, I could have a treadmill for $200!" Not so fast. The Weslo Cadence G-25 could provide a good workout for your son’s hamster, but not for you. Why spend $200-$300 on a Weslo Cadence G-25 treadmill when for the same amount you can buy a new pair of walking shoes, an iPod, a pair of cheap sunglasses and still have cash in your wallet? 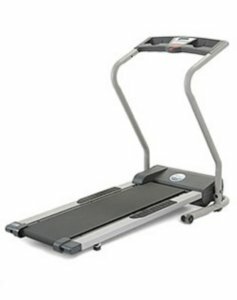 Sarcasm aside, if money is an issue then wait and save a bit more and then buy a better model, such as the Weslo 50SE, one of the best budget treadmills you’ll find under $500.